Resolved: Shift icon, credit card icon images are blurry on a retina display. Resolved: Formatting issue on tryshift.com relating to the plus sign on the app integrations pages. Due to the changes made to the existing onboarding flow in Shift, some existing users experienced difficulties logging in to their accounts. Resolved: No desktop notifications shown on Windows 10 or Mac. Resolved to ensure that email desktop notifications work as expected on Windows 10 and Mac. Users on the Beta Channel version of Shift receive repeated prompts to update their version of Shift. Resolved to prompt Beta users to update only once. Now, all users can log in successfully to the Hubspot extension. Now the maximize button is shown at all times in Shift. Clicking on the purple email referral button in Shift will pop a window to send referrals via email. Onboarding flow includes the addition of several email accounts to ease the transition for new users. When Shift starts up, a new video is played to welcome users back to Shift and create a pleasant first-time experience. The Shift onboarding process is getting better and better! Now, Shift automatically detects your main email provider to make the initial stages of the onboarding processes easier than ever before! Step 2 of the onboarding process now features a convenient scroll feature for Shift Bosses who have too many email accounts to show all at once. After a user has added an account to Shift and Shift detects the account type, users can use the drop-down to verify the details and make changes. Remove accounts during the onboarding flow by clicking the “x” button to the left of the email account. We’ve added the ability to make Shift your default email client right from the beginning. Just click the checkbox during the onboarding flow to set Shift as your default. Updated: Open Google Docs in Chrome! As a Shift Power user, you can choose to open google links in Shift in Chrome or in a pop-out Shift window. To customize head over to Settings > General. Updated: Notification for users who add an Office 365 accounts as their primary. Unfortunately, Office 365 accounts cannot be used as primary Shift accounts. We’ve made this more clear in our initial set up process by adding a red text notification for any user who attempts to add an Office 365 account as their primary. We’ve simplified our onboarding process so you can get to inbox zero faster than before! 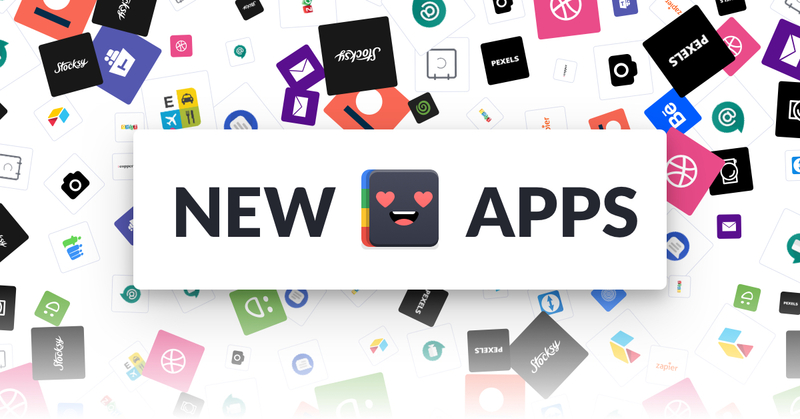 Updated: 22 New apps are here!